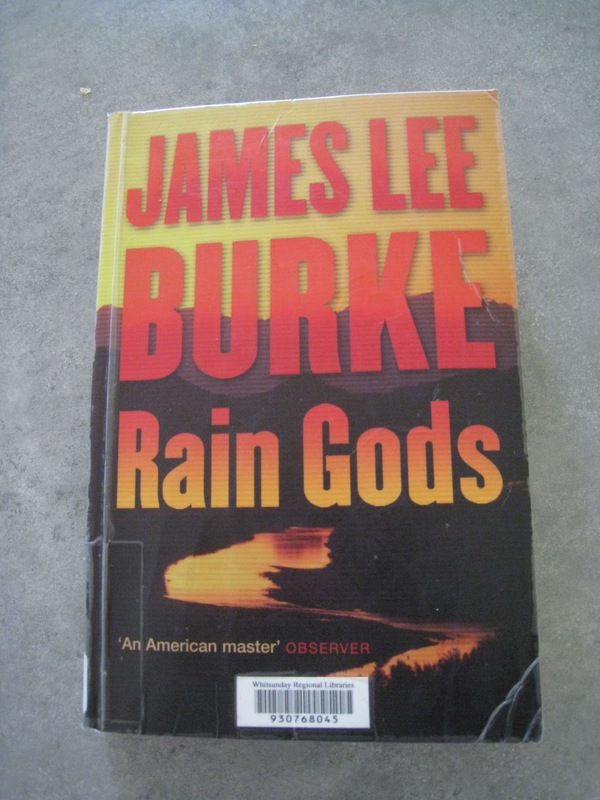 The Little House of Concrete Bookshelves: James Lee Burke "Rain Gods"
James Lee Burke "Rain Gods"
I've remarked elsewhere that James Lee Burke could probably come up with a convincing and totally chilling psychopath and/or sociopath in his sleep. The Dave Robicheaux novels are literally crawling with 'em, and there's a liberal sprinkling across his other titles as well. With that ability to conjure them up there may be a willingness to kill them off, which makes me hope the other lead character in the Hackberry Holland series proves to be an exception to the rule. One hopes that the final Hackberry Holland novel has already been written, and is scheduled for posthumous publication because on the basis of Feast Day of Fools and Rain Gods I hope we're in for an extended series that won't quite be the same if he manages to definitively kill off the Preacher.. Rain Gods slipped by unnoticed two years ago, and my enjoyment of Feast Day of Fools meant I had no choice to go back and read the prequel, and the reading experience was definitely worth it. A glance at the James Lee Burke Wikipedia entry has a Dave Robicheaux scheduled for next year and I've got my fingers crossed in the hope of a Hackberry Holland in 2013. The landscape along the Texas/Mexico border is probably the appropriate environment for a bible-quoting sociopathic psychopath, and there's probably quite a few of them lurking out there in the border badlands, but one hopes there aren't too many like Preacher Jack Collins out there in the flesh. I'm not aware of any literary or personal link between Burke and Warren Zevon, and the I'll Sleep When I'm Dead Zevon biography doesn't feature an index but reading these two stories it certainly seems there's a fair bit of the old eternal Thompson gunner still stalking through the night here. With nine illegal aliens machine gunned and buried in a shallow grave behind a church, and Iraq veteran, Pete Flores, and his girlfriend, Vikki Gaddis on the run from a collection of players who want them removed from the picture, terminated, as the saying goes, with extreme prejudice Sheriff Holland and Deputy Pam Tibbs set out to piece together a picture that's complicated by personal agendas and vendettas among a variety of underworld influences. It's a complex jumble of threads with Preacher Jack at the centre of things, a psychopath who seems to see himself as an avenging angel and manages to draw information from a variety of reliable sources that lesser mortals such as you and I might be inclined to dismiss. So, with Pete Flores and Vikki Gaddis on the run from the people on the fringes of the killings (Pete was involved, and knows a bit too much for his own good), the FBI, Immigration and Customs Enforcement and other forces of nominal law and order who are pursuing their own larger agendas and Hackberry Holland, haunted by back pain, Korean War nightmares and obsessive memories of his late wife, Rie, most writers would have left it at that and proceeded from there. Burke, on the other hand, starts with a dozen major characters and half a dozen plot lines, throws extra players into the mix where needed, brings them back as necessary and ties things together rather deftly at the end, leaving enough room for Preacher Jack to reappear in Feast Day of Fools as the Epilogue notes sightings of an emaciated man who foraged in landfills and Dumpsters and wore rags that were black with grime and a rope for a belt and whose beard grew in a point to the middle of his chest. After a spell in the wilderness, you just know, even without having read the sequel, that he'll be back. Once again, Burke demonstrates his skill as a master storyteller, writing with a clarity most of us would envy and few could hope to emulate and delivering a multifaceted story where nothing is quite what it seems and tortured souls operate in their own distinct and strangely moral universe. A masterpiece that deserves to be reread to pick up the details you missed last time around…as the reader savours the elegant mastery of language on offer. One might be tempted to apply tags like his best so far, but when each successive volume attracts the tag it seems easier to say another James Lee Burke and leave it at that. James Lee Burke "Feast Day of Fools"
Peter Robinson "Before the Poison"